How Should I Back Up My Computer Before an Operating System Upgrade or Reinstall? - Ask Leo! I’m about to upgrade my operating system to Windows 10. How do I protect myself if something goes wrong? I’m about to reinstall Windows. How do I start? I’ll explain what that is and how it protects you from disaster. By backing up everything, there’s no guesswork involved. You’ll capture everything you could possibly need. Let’s say the upgrade turns out to be incompatible with your system; it’s not going to work, for some reason. Perhaps the upgrade turns out to be incompatible with you. You just don’t like it! Maybe there’s just something wrong, be it personal preference or fundamental system flaw, that makes you regret ever trying to apply the upgrade. Even a clean reinstall could leave you wishing you hadn’t started down this road, for various reasons. If you’re running Windows 7 or later, you can use the built-in backup program to create a system image. While I’m not a huge fan of the backup software included with Windows, it does meet the “bare minimum” required, and can do a fine job of creating a backup image. You’ll find the options to make a full system image in Control Panel. The process is relatively simple. Here’s an article that outlines the process in Windows 10, and I do have a book on the topic. There are many good alternatives, including free ones. My favorite is Macrium Reflect. Here’s an article that outlines the process using the free edition of Reflect, and there’s my book, Saved! Backing Up with Macrium Reflect. My number two choice: EaseUS Todo. Here’s the article that outlines the process using EaseUS Todo Free, and my book, Saved! Backing Up with EaseUS Todo. If you’re not going to spring for the paid version of Macrium or EaseUS, that’s fine — the free versions are perfect for taking complete system image backups, and that’s all you need here. Where: I strongly recommend creating the image backup on an external hard disk and saving that image for some time — until you’re confident your newly installed operating system works and is to your liking. Once you’ve made a system image backup, what happens if you need to use it? You may need to create “rescue” or “emergency” media — a bootable CD or USB thumb drive — for the backup software you’re using. You can usually do this on another machine, if you like. If you’re using Windows own backup software, the original installation media is often already set up for this, or you can create a recovery disk. Attach the external drive containing the backup image to your computer, if you haven’t already. 99% of the time you’ll never need to do this. But that 1% is why I so emphatically recommend creating the backup image to begin with — so you’ll be able to do revert should you need to. If you’re already doing what I really recommend — backing up regularly and automatically — not only should none of this be news, none of this should even be necessary. You’re already creating image backups. I recommend backing up not just for major operating system upgrades, but because it’s the right thing to do. You’re much more likely to run into a problem from hardware failure or malware infection than you are from an operating system upgrade. « Previous post: Sometimes you may want to explicitly keep someone from contacting you. Ignoring them is often simplest, but there are tools to help as well. I’d add two steps to the restore process. Before restoring to the previous system image, make a system image back up your Windows 10 installation. Then, after restoring the system image of the previous OS, copy all of the data files you’ve created using Windows 10 to your newly installed system. If you made a fresh install of Windows 10, that would include all of your data files. My experience with Windows 7 was pretty uneventful except for a few hiccups installing it keeping all of my programs and settings. There are a few minor glitches which still show up like losing some file associations which have to be re-established. 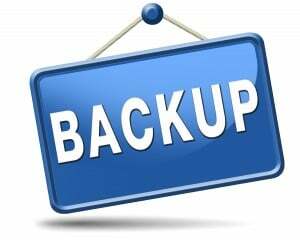 But working for Ask Leo!, I’ve seen enough horror stories to say make a full system backup of your system before upgrading or reinstalling and make a copy of your backup before proceeding you can simply copy the backup files from one external HDD to another. If there’s only one copy of the original system image, it’s not backed up. Thank You Leo. You answered my question in this ezine before I had to ask it. “Could I go back to Windows 7 after installing Windows 10.” Yes, I’ve been using Macrium Reflect for the past couple of years. It saved me a few time when I downloaded and executed different programs, even though I always try to download from known sources. Sometimes when I uninstall a program some parts are left and a restore takes care of that. Try telling Macrim Reflect that you want a “System Image Backup”. THERE IS NO SUCH CHOICE! Once again in Reflect 6.0 you can make a backup of “selected disks” or “partitions to restore Windows”. Simply either bad technical writing or Reflect CANNOT make a complete system image backup. There is also a link near the middle of the main screen which says “Image this disk”. That will also make a system image. It’s not possible for a program to list all possible synonyms for what something might be called. Both are variations of System Image Backups. Note that Windows 10 has an option to revert to the previous OS as long as you do it within the first 30 days. Though having an image as Leo suggests is a good idea – a very good idea, a very very good idea. Especially if you change your mind on day 31 or after. I tend to agree with other posters about not liking macrium reflect. I did in fact try it on my Win 8.1 machine before changing anything and got the recover disc to boot mode just fine. However, when I went to recreate the disc for another copy from within reflect, that disc DID NOT work. I have used acronis forever on Win7 and earlier windows just fine. I just did not want to upgrade to individual copies (price $) for a version that supported new OS. Anyway, tried macrium on my other machines and not even 1 boot disc would work. I did get the original boot disc imaged for another copy but my systems are all totally different configurations (rather old cpu’s, motherboards, controller cards for old old hardrives and reflect can’t boot them). I’ve tried most of the top free contenders for imaging software and found most of them slow at doing the job after getting under the hood on settings and learning curve. Someone here mentioned AOMEI backup and so I decided to try it out. WOW, ALL my computers boot discs work, all win OS versions and it’s FAST at imaging and also free. It’s my new save me from disaster favorite. Just my experience for rolling back to a good time frame. I’ve tested Aomei and EaseUS Todo Backup, and found them both to be excellent. I use Macrium paid edition, but if I were to use a free backup program, it would be one of those two. Western Digital offers a free version of Acronis and will work on any machine that has a Western Digital drive. As an Electronics Engineer and IT Pro, I heartily recommend every Western Digital product (except for the low-cost “Portable Drive”s). In fact WD invented the Winchester mechanism for what we now call a “Hard Drive”. First and Best. By the way, most retail PCs include a WD “Blue” series drive. It’s perfectly fine, but they have many other series that are faster and more reliable, and only a bit higher cost. When I’m building a PC for commercial use, I normally use Black – It’s a bit faster and a lot more reliable – or Green – which comes at a decent price and consumes substantially less power and therefore throws off less heat. All the info is at wd.com. btw, I don’t get anything from WD. Like Leo, I recommend what is proven to work well and add no worries to my life. The same is true of Seagate as long as you have one of their drives (internal or external) on the system. It also works with several other makes – Fujitsu is one, I think. Functionality outside backup and restore is limited and prompts you to get the paid upgrade. Beware, don’t be mislead by the latter’s claim to create VHD files from its proprietary backup in the current paid version , it only actually creates Microsoft .vhdx files – no good for Virtualbox users! Thank you for all you do, Leo. You are MY HERO! I love you, man! I really want to get Macrium Reflect free version and do a system image backup, but can you comment on the subscriber comment that I have pasted below? 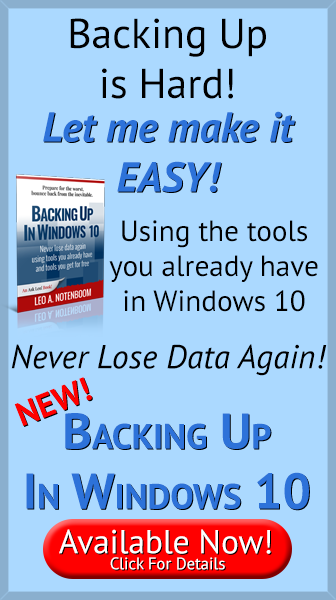 You want to backup the partitions to restore Windows. What about the freeware edition of EaseUS Todo back up software? Any different from Macrium? Leo is looking into EaseUS TODO free and Aomei Backupper as possible alternatives. I checked both. My conclusion is that all 3 do the job. I find EaseUS and Aomei both excellent, and it’s difficult to say which is better. They both include incremental backups in their free versions, an advantage over the free version of Macrium. The inclusion of incremental backups in the free versions is why Leo had me check them out. I’ve found Aomei and EaseUS both very easy to use. I use the paid version of Macrium, and I’ve found that Macrium’s strong suit is in the scheduling options. The learning curve for that is a bit steep, following Leo’s instructions in his book make it easy. Now that Macrium 6 is out, it offers differential backups in the free edition, which although they take up more space than using incremental backups, the space requirement is probably not so much greater for the average person unless they add lots of photos, music and/or videos. Well, of course it’s different since it’s a different program, but it should be able to be used to the same effect. The difference I noticed, was Macrium restore time is about 25% faster. Won’t “Image selected disks on this computer” and then choosing all the disks, give you a total B/U? What EXACTLY does “Create an image of the partition(s) required to back up and restore Windows” buck up? E.g. if your data is all on disk D does it get backed up? Although Macrium has saved me I still think it is unnecessarily complicated. The 2 options above are excellent examples. It should if you selected all of the partitions of your system drive. “Create an image of the partition(s) required to back up and restore Windows” backs up everything on your system hard drive. This should include the D; drive if it on the same physical platter as the C: drive. You can check to see if this is the case by looking at the top row where it lists the partitions of the system drive. Make sure it is ticked. If not tick the checkbox. There are a few roads which lead to Rome in many programs. OK I just read the relevant chapter of Leo’s book. NO the D drive is not backed up unless I select the right option. But after I revised my schedule I got a problem that I’ve had with macrium several times. Without warning the program hangs up. It continues running but does nothing. The only way to get it to run is to shut down and restart the computer and run the backup manually. Shutting down Macrium with task manager won’t do it. This is very irritating and never occurred with Ver 5. Obviously if you don’t catch it, you’re sunk because it stops all backups! Here is a quote from an e-mail I got from them today: Hello Peter, Thanks for contacting us. The forums is for paid customers only. Regards, Gosha Kolosov – Macrium Support. BTW Leo, I love your e-mails, I have been getting them it seems forever. I like to read all of them and get a lot of useful info. Thanks very much. All the comments about back ups shown above have my attention. I’m not a geek but I have used a computer for longer than I care to mention. I never get into the real fine points because I’m one of the lazy ones that just want my system to work – like an automobile – I’m not a mechanic either. Leo, I’ve read your instructions from your 4 suggestions on how to revert back from Windows 10 to Windows 7. But I’m nervous about doing it since I did not do a full image backup just before I installed the new OS. I do have a backup from late July. Will that work ok and I’ll just lose anything I’ve added (not much) since then? I’ve posted your web address on my Facebook timeline so more people will contact you for info on this issue and know that I trust you highly. If that’s a full image backup from July, then exactly – it should work and the only thing you’d lose are all changes and updates made since then. Caveat: I don’t know what backup software you’re using, but conceptually what you describe should work. As a precaution and to preserve any files you created since your last backup, I’d back up my Windows 10 before restoring Windows 7. If I do not like what I see, I remove the “upgraded HDD” and put in the “back-up” (a.k.a. a “hot spare”).. I am a bit surprised that this was not mentioned at all! For all practical purposes, a system image back up is the same as a clone minus the empty sectors. What’s the difference between disk imaging and copying? A true clone copies sector by sector. That is to say, Platter 1, Track 1, sector 1, is copied exactly to Platter 1, Track 1, sector 1 of the clone. It also copies partition information, recording format, boot settings, the sector map and platter layout, and all the rest. It’s a true “bare metal copy”. Turns out it’s pretty easy to do that. The software doesn’t have to find all the bits of a file (any file is separated into 1k blocks and scattered all over the drive wherever there’s space. It just reads a sector, writes a sector, and repeat until every physical sector until done. Note that a clone will have the same fragmentation as the original, whereas a file copy will give you nicely ordered, tight files, until you edit anything. I have upgraded to Windows 10 from 7 Ultimate and am perfectly happy with it. What happens if i want at some stage after year 1 to format my hard drive and reinstall programs. Do I then have to buy Windows 10 ? Worst case I think you reinstall Windows 7 and then upgrade it again. Better would be to have an image backup of Windows 10 installed that you would just restore. Would you be able to upgrade it free after a year? Wouln’t you have to pay for the upgrade if you upgrades after a year. Or would that fact that you were already using 10 validate that as a Windows 10 license. My understanding is that that is so far an unanswered question. As long as you keep the license key from your Windows 10 installation, you should be able use it over and over again on the same machine. For example you could install 2 identical copies of Windows 10 and dual boot, both using the same license key. Because you only run one at a time, on the same PC for which you were ranted the license, it’s not just legal, Microsoft can’t tell the difference. (D’uh. There IS no difference). Btw, if you replace a dead computer with new hardware, and therefore try to reuse your existing Windows license on the new machine, you usually need to call Microsoft and they will fix their license database manually. I did that once and it worked. It took 3 phone calls to find a tech who understood that it was legit and was willing to help. After you have done the upgrade, a hash ( hardware identifier ) of your computer is stored at MS. If you use the tool supplied by MS, to make a thumb drive with Win 10 for installing, then you should be able to do a clean install later on with out having to worry about activation. After I upgraded, my hard drive went, and I had no issues with doing a clean install on the new one , and activation was instant. I’m a PC tech and tested the upgrade vs clean install process regarding activation. Gary T. above is correct that when you first UPGRADE from Windows 7/8/8.1 to 10, a hash ( hardware identifier ) of your computer is stored at MS. Subsequent installs will use that hash and automatically activate your Win 10. To verify this, I took an older shop PC with Win 7 Home Premium and upgraded it to Win 10 Home and it activated just fine. Then downloaded the Windows 10 tool, created a CD and then booted the CD, wiped the drive and did a clean Win 10 install and it also activated. Then, to see if a new HD would cause a problem, I put in a brand new HD and did a clean Win 10 Home install using the CD and it also activated just fine! Rufus is a program which would do that. This article explains how to do it has a link to download it. I recently used it to install Windows 10 to a computer which wouldn’t boot. Thank you for the Macrium Reflect Free tutorial. I am replacing Windows Vista with Windows 10. I have followed your instructions step by step. I backed up all my files on my external hard drive and followed all the steps to back up the system image from my C and D drives to my hard drive (H drive) and received the following error message; Backup Aborted!-Unable to read from disk-error code 1117-The request could not be performed because of an I/O device error. I work out of my home office and need to complete this task ASAP. Do you have any helpful input? Thanks again! Usually the thing to do in a case like that is to run CHKDSK /R on the drive being backed up and the backup drive. I have a Dell Windows 7 Ultimate with 2 hard drives: a C drive and an F drive. Can I do a backup Image of the C drive and store in on the F drive and then install the free Windows 10 on the C drive?? Should I reformate the C drive before installing or would installing the new Win 10 take care of ‘cleaning’ the C drive for use with Windows 10? I never recommend backing up to a drive inside the box. It can work, but it’s a risk as a problem with the box can take out all drives at once. You don’t need to reformat C: before upgrading to Windows 10. In fact you don’t want to, so as to be able to preserve all your programs and data. Hi I have a question about bakups! I have a 4TB hard drive that I diveded into 4 Partitions and I wanted to do a Image Backup to one of my Partitions. When I tried to do it the Backup software only reconized the whole drive NOT the 4 partitons. So if I go foward it would wipe the entire drive! Is their any way to reconize the 4 partitions so I can make up 4 seperate images? Depends entirely on the backup software you’re using. I have “Program Files” folders on all 12, where I installed various software. Windows 7 is *ONLY* on 1 of the 12 partitions. I need to know *WHY* I should back-up massive files on all 12 partitions, if my W10 upgrade is only going to touch C:\. It’s not enough to just say “do it”… I need to explain *WHY* to several of my managers. They need more info than just “do it just in case”. It’s normally OK just to back up the system drive, but the fact that you have program files on those other drives could potentially put some of those installations at risk. If you’re willing to risk that or have installation files for those programs, you could probably get away with backing up just the system drive. In any case, those drives need to be backed up simply because any unbacked up drive is at risk. Those partitions should be getting backed up regardless of whether or not you upgrade, because hard disks fail, data gets lots, “stuff” happens. You need to ensure that the C: partition and the boot record is getting backed up before an OS upgrade. THat means, to me, backing up the entire physical disk that contains C:. All else is optional with respect to the OS upgrade, in my opinion. I specifically did NOT want to give my manager a reason of “we need to back everything up… because we need to do regular backups”. This is *ONLY* about “the minimum needed before moving from W7 to W10, today”. Will a W7 to W10 upgrade change *ONLY* things on my C partition? you running W7 or W10 now”? Thought I answered that, but yes, the minimum required is C: and the boot record. Yes, the upgrade can touch the boot record. The easiest way to back those both up is to back up the physical disk, no matter how many partitions it has. But that’s up to you. Just wanted to thank you for your help. I feel u are honest and supportive. Thank you for your time. U rock! I use Macrium on my desktop on a good schedule. Is has worked well and has saved me. I had problems with EaseUS. It seemed to “break” ever time a new major version came out, so I switched. I also use AOMEI backupper on machines I am repairing for friends and family. It is also the only one that worked for me on my W10 laptop that I was upgrading to a SS drive. EaseUS and Macrium would not do the clone and also had problems just doing a restore from backup. AOMIE worked perfectly the first time. macrium. I connected the old drive externally to transfer files. Saved time. Did not have to boot from cd and all. the old one as a second drive, after having done the new installation first, is the method I use. Then it is easy to copy all necessary data to the new installed system, even %USERNAME%\Appdata folders. Naturally most programs need to be reinstalled, but on the otherhand one has a clean system to start with. And of course everything is backed up regurally. I use Norton Ghost for backup. All my computers have a second hard drive,D, which I backup to. Then about once a month, or when I make a major change, I have a third hard drive that I temporally put in the computer and use Acronis and clone the hard drive then take it out and set it on a shelf for safe keeping. This system that I use has saved my bacon several times and saved me a lot of grief over the years. All my computers have 3 dedicated hard drives assigned to them, one for C, one for backup, D and one cloned. I call this cheap insurance. I have a problem with creating a system image of my laptop. I have a Lenovo ThinkPad X220 Tablet laptop that runs on Windows 10 (64-bit version). It does not have a CD drive. I have a 1 TB external hard drive that I want to save the system image to. I keep getting a message that it’s not a valid drive — but it doesn’t say why. I cannot use a thumb drive, since thumb drives are formatted in FAT, rather than NTFS. I seem to be stuck. How can I create a system image when I have no place to save it to? Are you sure you’re specifying the correct drive? Are you sure you can read and write files on the drive? EaseUS Todo has a page with a possible work around: https://www.easeus.com/todo-backup-resource/the-drive-is-not-a-valid-backup-location.html – yes, #1 is to use a different tool (my recommendation as well), but they also have a workaround for the built-in backup tool as well to try. Leo, I see that you often recommend Macrium Reflect FREE version. Is there ever a time when an ordinary home-user like me should consider the paid version? If you want the extra features the paid version offers, for example, incremental backups which is a great feature. If you want a free program which offers incremental backups, Leo also recommends EaseUS Todo Backup. I find Macrium Reflect had better scheduling options. It’s all a matter of checking the features the paid versions offer and deciding what you want. The missing feature, I believe, is incremental backups. I generally recommend those, so that and the ability to get support from Macrium are two good reasons.